Forgotten is the storm, the clouds now vanish. The freshening breezes, heavy airs will banish. Behold the brilliant Sun in all its SPLENDOR! This sun, my dearest, tis naught but thee. Shall now my sun, forever be. With golden Light it covers all creation. Behold the radiant sun mid evening shadows. So what are the lyrics and music of this song conveying? To me, O Sole Mio is a story of feelings and emotions — of happiness and love. The feelings elicited are those of “joy of living,” “gratitude and appreciation for the beautiful,” and, “happiness to be able to spend time appreciating my Beloved, who means as much to me, as the Sun does to the earth. 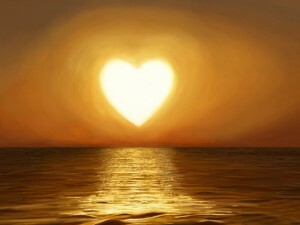 In fact, My Beloved IS MY SUN!” And what would we ever do without OUR SUN? O Sole Mio – Oh, my beautiful, brilliant sun – how very much I love – I adore you! Association of the Divine with Light and with the SUN is one of the most deeply archetypal of human conceptions. One finds solar mysticism or the mysticism of Light prevalent in many traditions. According to the mystic prophet, Edgar Cayce, the Sun is the source and sustainer of life, penetrator of the darkness, warmer of the cold, nurturer of the seed deep in the soil. Its rays reach out through the darkness of space and night, and give warmth, light, and life to all they touch. 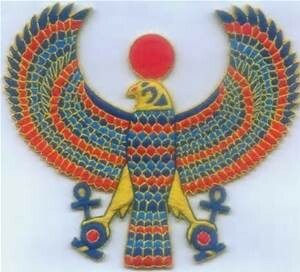 The ancient Egyptian Sun God was Ra (originally pronounced, “ray”). Ra, is the most high God. 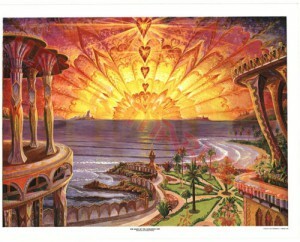 Out of the great “Ray” came countless little rays, known as the sons and daughters of Ra. They are godlings from the one God, created in his image and destined to fill all the cosmos with light and life. The Beloved, or the Sun (Son) could also represent OUR Divine Reality, our Christ Consciousness, our connection to or Oneness with our God. And this song could be saying, we are so delighted, so joyous, so ecstatic that we can spend time getting to know who we truly are at the core of our being — Our Divine Reality. And the very vibrations of this music — and the feelings those vibrations engender — help us become better acquainted with our True Self, Our Divine Reality. Music can attune us to the Holy Spirit, the ascended masters, and the angelic hosts of light. It can also attract the ascended masters and angels into our world. Who could ask for more? So I will end this blog entry by infusing you in the high vibrations of O Sole Mio as sung by a trio of talented young Italian men who call themselves Il Volo, Italian for “The Flight” — since they indeed wanted their music to “take off.” This pop/opera trio consists of singers: Baritone: Gianluca Ginoble, and tenors: Piero Barone and Ignazio Bochetto. I always support dancing around the house as you take into your body and your home the energies– of MY SUN! Filed under: Dr. Kay Johnson-Gentile, My Sun! |	Comments Off on O Sole Mio – My Sun, My Sun!